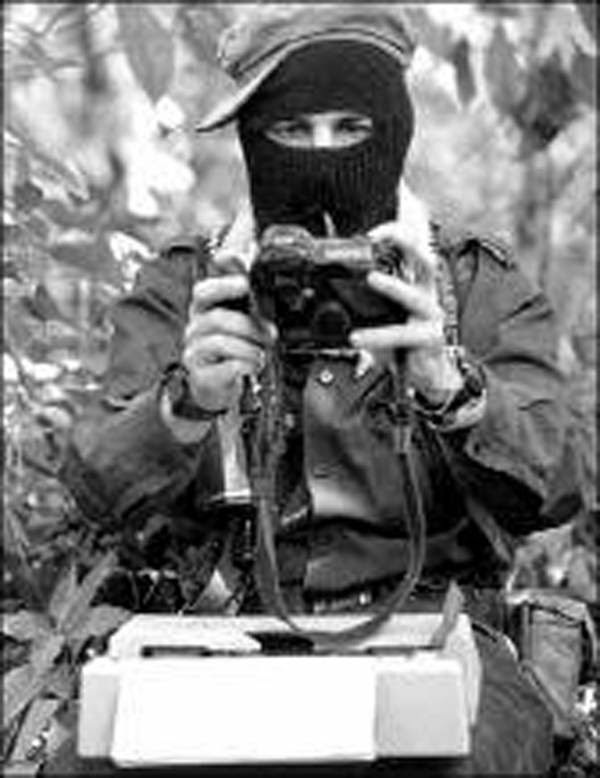 We send you all [todas, todos, todoas] the sincere greetings of the men, women, children, and elders whose collective name is the Zapatista Army for National Liberation. With this greeting, we also send you our sincere and honest respect, admiration, and affection. First, we want to thank our compañeras and compañeros of the CIDECI-UNITIERRA who are providing us, as they have done in the past, with shelter, food, and space for our ear and our word. This week marks 20 years of existence for the light that was born in the hands of the originary peoples of this land called Mexico. This light was then and is now called the National Indigenous Congress. We had the honour of being present, through our unforgettable compañera Comandanta Ramona, at that birth where together, we as originary peoples, nations, tribes and barrios, ignited this light. This light is one of organization, of struggle, and of work, a long walk and a long fight waged through resistance and rebellion. Throughout these 20 years of struggle against the bad capitalist system and its rulers, we have met only with disrespect, repression, dispossession, exploitation, imprisonment, murder, disappearance, deceit, and manipulation. Our deceased Comandanta Ramona, Tata Grande Juan Chávez, honorary Insurgent Major Félix Serdán, compañero Ramiro Taboada, brother Efrén Capíz, and the other names that mark the absences for which we grieve today and always: indigenous women; indigenous youth; originary adults and elders, our wisest people; indigenous migrants; and all of the disappeared, murdered, abused, humiliated, prostituted, and forgotten, objects of mockery, scorn, and disrespect. Along with them, we also remember the injustice, and impunity that, as State policy, take the name and face of the 47 missing from Ayotzinapa. Let them feel with us all of this pain, all of this rage that now convoke and provoke us to think about what should be done for those who are no longer here and those who are yet to come. May they speak through our lips, listen in our hearts. May they live in our collective being. Through our thoughts and our actions, may they know that they are accompanied, that they are not alone. As we said 20 years ago: nothing new, nothing for the good of the originary peoples of Mexico and the world will come from or be born of this capitalist system. Those capitalists will never seek out or even imagine a path to change for a better life for us, originary peoples, nations, tribes and barrios. In the capitalist system in which we live, there will be nothing good for us, the poor peoples of the countryside and the city. What we need and want as originary peoples of Mexico and the world will not be born of that system or from those capitalists. We expect nothing from them other than more injustice, exploitation, and the many wrongs committed against us, the poor people of the world. There is nothing for us, nothing that we want or need, to be had from the existing political parties, nor from the so-called new ones that will come because they are made up of the very same people, people who simply jump from one party to another. We have seen and thought many things over these 20 years. Because we have already lived with death and despair for more than 500 years. This shows us and tells us that we cannot expect anything from this bad system and its bad rulers. This is what our history tells us and shows us through the lives lived by our grandparents, great-grandparents, and great great-grandparents. That is why 20 years ago we said that we must build our own path, our own destiny where there is freedom, justice, and democracy. Because we cannot trust even a tiny bit in the capitalist system in which we live. We met each other during the dialogue that we held when the people of Mexico demanded that we dialogue with the bad system-made-government, which didn’t keep its word. It is the bad system itself that showed us that we could not trust its words, which, as we have seen for over 500 years, it does not honour. But the dialogue among our originary peoples, barrios, tribes, and nations served us well, which is why we are here now as the National Indigenous Congress. To talk amongst ourselves as originary peoples was and is very important, now more than ever, because the destruction wrought by the capitalists on mother earth is extensive and that means that we will also be destroyed, because it is from and through her that we live. Dialogue among us does us good, it helps us to understand, it helps to guide our lives in many ways, but only working at it bears fruit, if we don’t work we will have no fruit. That work is done with our peoples, and the fruit is that the people themselves work to organize themselves, struggling, striving, and sacrificing, as many times as is necessary. If we don’t do this work, who will? No one is coming to do it for us; we know that well. Now the time has come for us to not only know and say these things; now is the time to address what happens in our lives: injustice, misery, inequality. This requires us to organize ourselves in order to carry out what we say, or to put into practice the steps to correct and improve things where we see we have made mistakes. Compañeros, compañeras of the National Indigenous Congress: it was at this time 20 years ago when we raised our heads—body and soul—and said, let’s organize ourselves, let’s work and struggle. Today we believe that is precisely why we are here: to see ourselves, listen to ourselves, understand what we have done, how we have done it, what we still have left to do, and how we will do it. We are here to see where we have made mistakes and how to correct and improve them. Today more than ever we need to be united, in the countryside and the city. Wherever we live is our trench of struggle, work, and organization, in every community, every nation, every tribe, and every barrio, as originary peoples. Compañeras, compañeros, compañeroas of the National and International Sixth, we think that it is the same for you, wherever you live is your trench of struggle, work, and organization, in every barrio, every school, every factory, every hospital, and so on in every city, municipality, and state. We can only achieve this by working and organizing ourselves; that is where the ‘how’ and the ‘what’ to do are born, according to the situation we live. Compañeros and compañeras of the National Indigenous Congress: today more than ever we need to continue the struggle of our ancestors, Resistance and Rebellion, but now we must struggle for the real change that we as the poor people of the countryside and the city need. We ourselves need to build the world we want. Compañeras and compañeros of the Sixth of Mexico and the world. We who are exploited need to work together, in the countryside and the city, to construct the world that we want. We think that we should dedicate our energy, our sacrifices, to working and organizing ourselves, so that we know what to do when the need arises. TODAY WE HAVE NO OTHER CHOICE but to buckle down and organize ourselves, the original peoples of the countryside and the city. This is especially true for us as originary peoples, barrios, tribes, and nations, because we no longer have anywhere to take refuge. We are attacked in the countryside and in the city; no one will have any place to seek refuge. Today we, the exploited, need to lift our gaze and organize ourselves, to work and struggle to be organized together between city and countryside. We originary peoples of the countryside and the city are witness to the truth that the capitalist system holds nothing, not even the tiniest possibility, to make life better for the originary peoples and those from the city. Today they want to truly destroy us, to do away with us through the slavery of capitalism, and simultaneously complete the destruction of our mother earth and nature. Today we need to study by listening and looking, to learn by sharing and practicing, to understand how and from where bad things come and how and where the good exists. This should be born from within us: how to leave the bad behind and begin to do good. We must study our histories and our past in order not to repeat the bad, but to correct and improve things. As powerful as the exploiters may be, no one can win against an organized people. So, compañeras and compañeros from the National Indigenous Congress, compañeros, compañeros and compañeroas from the Sixth in Mexico and the world, brothers and sisters of Mexico and the world below and to the left, let us organize and struggle to make a better world, working and building with intelligence and wisdom. Originary peoples of the world, scientists of the world, artists of the world: if we organize ourselves we can save the world and build another, much better one. For this task we must become better fighters in the struggle. As we seek out and talk among ourselves, compañeras and compañeros from the National Indigenous Congress, we must be an example for our families in Mexico and the world, we must show them that no one will struggle to liberate us other than ourselves. It is up to us to show the way. Understand, those who want to understand. Now is the time when the steps of the originary peoples will reseed these soils. Now is the time for these skies to be filled with all of the colours of those who are the colour of the earth. Now is the time for the collective heart that we are to become even larger. May it become home, comfort, and inspiration for the struggle of those who think they are alone and have nowhere to go. Now is the hour of our peoples, our nations, our tribes, our barrios. Now is the time to remind the Ruler and his managers and overseers who it was who gave birth to this nation, who works the machines, who creates food from the earth, who constructs buildings, who paves the roads, who defends and reclaims the sciences and the arts, who imagines and struggles for a world so big that there is always a place to find food, shelter and hope. Thank you, National Indigenous Congress. Thank you for not giving in. Thank you for your brotherly step, for your attentive ear, for your generous word. We say clearly that our struggle is for life. MAY THE ORIGINARY PEOPLES, BARRIOS, TRIBES, AND NATIONS OF MEXICO AND THE WORLD LIVE! MAY THE COLOR OF THE EARTH THAT WE ARE SHINE ONCE AGAIN! MAY THE GAZE AND THE STEP OF THE NATIONAL INDIGENOUS CONGRESS, THOSE OF US WHO ARE IN AND WITH IT, RISE UP ONCE AGAIN! Thank you for your ear, your word, your heart.